Hi, I am interested in your 1984 Chevrolet C/K Truck (stock #4862-CHA) listed on Autotrader for $14,995. I'd like to get more information about this vehicle and confirm its availability. With a timeless color combo, V8 power, an A/C interior, and overall 4x4 appeal, this 1984 Chevrolet K-10 Custom Deluxe offers a lot of vintage truck appeal for quite an affordable price. The Forest Green Metallic looks good on this beefy Chevy. After all, its a deep green that blends in with nature, and at the same time, the more recent application radiates in the sunshine. So it has the ideal balance of looking like a nice classic but still never losing its outdoor-ready impression. Plus, theres plenty of nice bright work on the bumpers, wide towing mirrors, wheel arches, and Rally wheel package. Because theres liner paint in the bed and a tow ball on the rear bumper, you can look good even coming home from a big Home Depot run. Inside, the tan seat and door panels against the dark green trim is a timeless color combo. Plus, the black dash looks quite sporty as it surrounds the driver. This is a fine place to spend some time, especially because you have features like an AM/FM/CD stereo, cruise control, and cold-blowing air conditioning. Under the hood is Chevys famous 305 cubic-inch V8. This is believed to be the original motor for the truck, and it certainly look the part in this tidy and correct engine bay. Topped with a four-barrel carburetor, the V8 makes the right power and torque to enjoy this 4x4 to the fullest. Another great off-road feature is the three-speed manual transmission with separate crawling gear. That means you have the control to get the most out of the motor, including in situation when you need plenty of torque at low speeds. But this truck is great for more than just getting back to nature. After all, the power steering, front disc brakes, and Goodyear Wrangler tires are fine features for the street or trail. 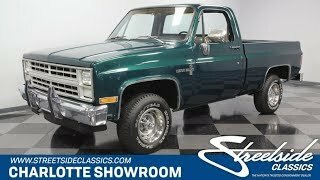 The right look; the right features; and the right price... this is a great deal on a cool classic truck. So dont let your opportunity slip away, call today!